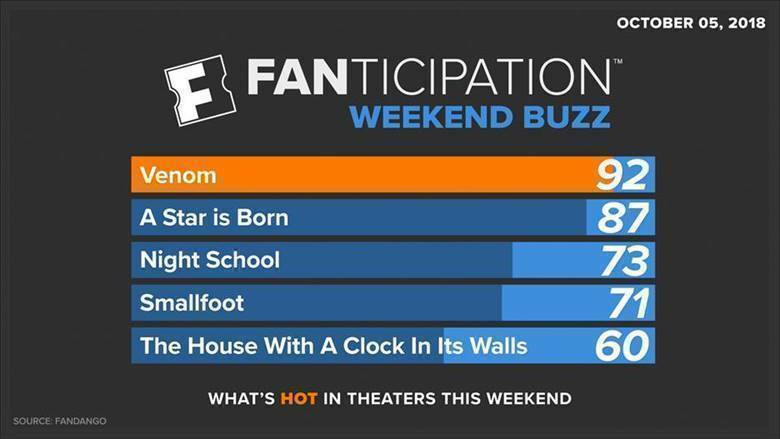 Los Angeles (October 4, 2018) – “Venom” and “A Star is Born” are leading Fandango’s weekend ticket sales and Fanticipation movie buzz index, garnering 92 and 87 out of 100 Fanticipation points, respectively. “A Star is Born” sold out hundreds of Fandango’s preview showtimes this week, and is currently outpacing previous October hits, “The Martian,” “Gravity” and “Gone Girl,” at the same point in the Fandango sales cycle. 90% are particularly excited to see Bradley Cooper’s first outing as a director. 89% are looking forward to seeing Lady Gaga’s first leading role on the big screen. 82% can’t wait to get the film’s soundtrack.